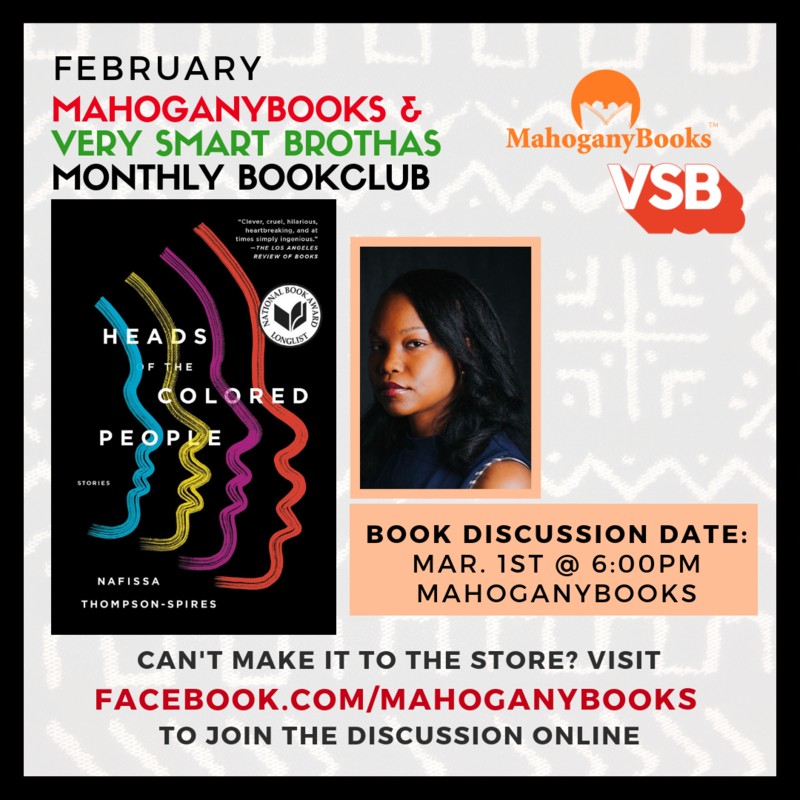 MahganyBooks & VSB invites you to join us this month for a book club discussion of Heads of the Colored People on March 1, 2019 from 6 PM to 8PM at MahoganyBooks, located inside of the Anacostia Arts Center. Stop by the store or head over to MahoganyBooks.com to pick up your copy today. If you are unable to join us in store for the book discussion, we encourage you to join us online on our Facebook page where the discussion will be live streamed. A stunning new talent in literary fiction, Nafissa Thompson-Spires grapples with black identity and the contemporary middle class in these compelling, boundary-pushing vignettes “stuffed with invention” ( Publishers Weekly). Each captivating story plunges headfirst into the lives of new, utterly original characters. Some are darkly humorous–from two mothers exchanging snide remarks through notes in their kids’ backpacks, to the young girl contemplating how best to notify her Facebook friends of her impending suicide–while others are devastatingly poignant–a new mother and funeral singer who is driven to madness with grief for the young black boys who have fallen victim to gun violence, or the teen who struggles between her upper middle class upbringing and her desire to fully connect with black culture. Thompson-Spires fearlessly shines a light on the simmering tensions and precariousness of black citizenship. Her stories are exquisitely rendered, satirical, and captivating in turn, engaging in the ongoing conversations about race and identity politics, as well as the vulnerability of the black body. ” Heads of the Colored People is a necessary and powerful new collection with, thankfully, not a dull sentence to be found” (Peter Orner, author of Am I Alone Here?). Boldly resisting categorization and easy answers, Thompson-Spires’s collection “cements her role as an incredibly important voice in literature right now” ( PopSugar).